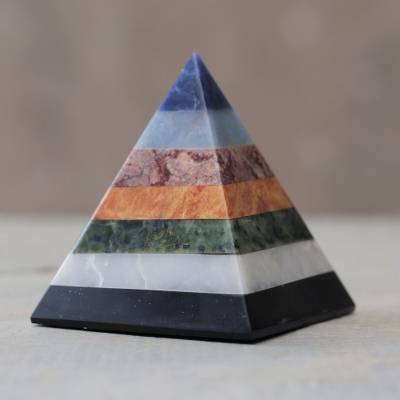 Artisan Crafted Seven Gem Pyramid Sculpture from the Andes, "Positive Spirituality"
Even more stunning than expected. Awesome energy. I bought 3 different designs to flow energy through the room from one window to another. "This is now one of my favorite things"
I thought this was well done and loved the texture and colors in it . "Lovely addition to my pyramids and crystals"
I love this piece. There is always something new you will see. Very well made! So smooth, such lovely colors, textures of the stone are amazing. Beautifully made with a perfect combination of stones. The colors look fantastic together & the artistry is gorgeous!